Yesterday I explained a bit about DNA and how it is one of the most compelling arguments for God’s existence, or at minimum for the existence of an intelligent creator of life. We had fun creating an activity to illustrate this to our kids. As you’ll recall, DNA is a language and it provides instructions to build critical components inside living organisms (including us). In order to get these two ideas across to our then 5- and 7-year olds, I created an activity based on language and instructions. Here’s what we did. I developed a treasure hunt with clues written in different languages. Even if you don’t speak a second language, google translate is a great tool to use to create instructions in a foreign language. I made a separate set of clues for each child. 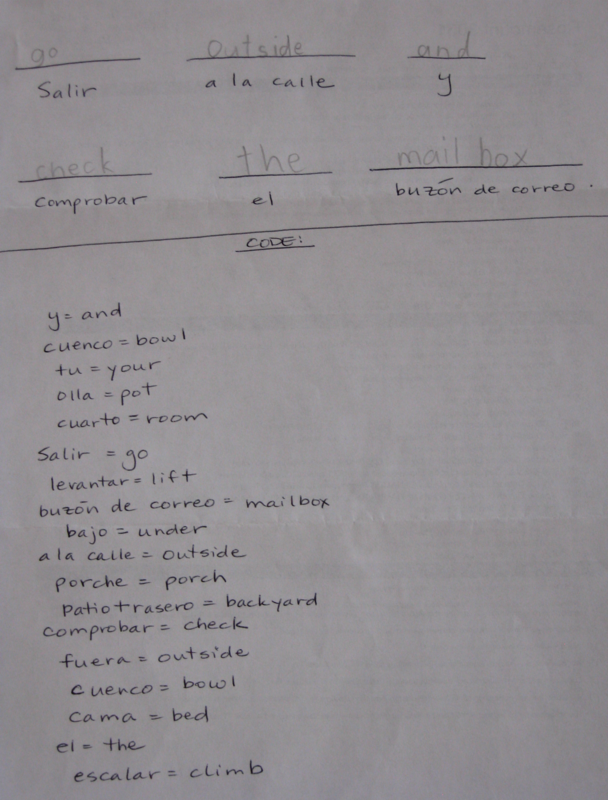 I wrote out the instructions to the next clue in a language they did not know and provided a list of words with their English equivalents for them to use to decipher the clues. I had thought of using non-human languages at one point (like symbols for each word), but that seemed like far too much work! I made up four clues per child, each in a different foreign language, with the final clue leading to a treasure (chocolate coins). Once the hunt was over, we asked the kids what the activity had to do with God (my favorite question!). They didn’t know. 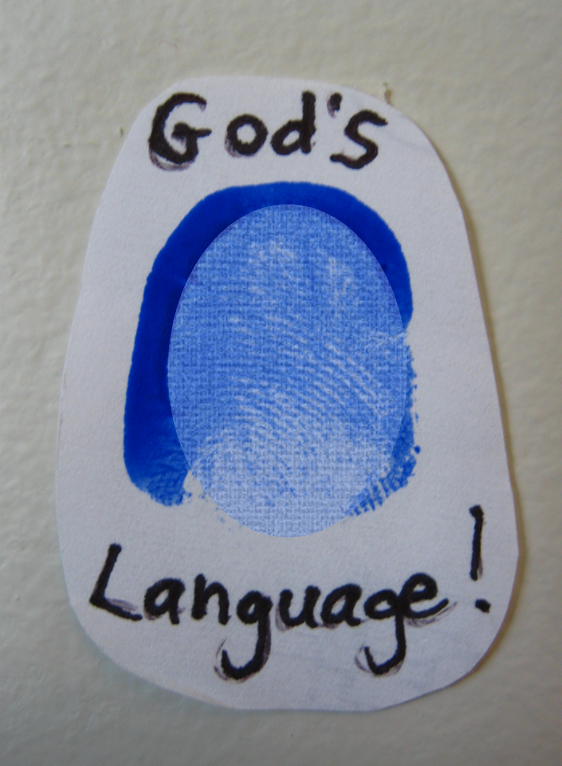 We told them that there is a language inside their bodies that God had invented (we called it ‘God’s language’). Just like the clues for their treasure hunt had given them instructions to follow in different languages, the language that God has put inside their bodies gives instructions to the various components of their bodies. We reminded them about the cell city that we’d made. God’s language provides the instructions to each part of the cell city, as well as for other functions of our body. God’s language tells the various components inside our body (or ‘workers in the cell city’) what to make, how to make it, where to bring it, etc. We had fun with this activity. It can be readily scaled up or down depending on the age of your children. I’d love to know if you try it! If your children are slightly older than mine (say, tween or young teens), you may be interested in this idea. It’s based on the classic example that is used to explain the complexity and sophistication of DNA. You’ll need either a bunch of scrabble pieces (this is easiest) or a bunch of pieces of paper with letters written on them (made to look like scrabble pieces). If neither of these work, then a pet and a keyboard will work as well. If you are using the scrabble pieces, open your Bible and randomly select a paragraph of text. Tell your children that you will give them one million dollars if they can toss all of the scrabble pieces up in the air and have them land in exactly the same order as the text so that the final result is the exact passage of text you’ve selected from the Bible. Tell them they can toss the letters up all day long if they’d like, as long as they come up with the paragraph by the end of it. If they complain, reduce your requirements to just one line of the text. They’ll likely still think it’s impossible, and that’s the point. A sentence that conveys meaning and instruction (like a line in the Bible, or DNA code) does not come together by chance. If your child could throw the scrabble pieces into the air and come up with a line of text from the Bible, everyone would conclude that something about the scrabble pieces was rigged (and NOT that he/she had just gotten lucky!). The same type of activity can be done with the family pet and a keyboard. Using the same random passage of text, ask how long it would take for your pet cat or dog or bird to type out that text by randomly pushing keys on the computer keyboard. (Go ahead, try it!) The same principle applies. Language that is complex but also carries meaning does not get produced by random chance. In fact, the only experience we have with complex language is that it is produced by something or someone with an intelligent mind. Remember, DNA is more sophisticated than the most sophisticated computer code that humans have ever designed. Could your cat walk on the keyboard and produce a single sentence from the Bible? Neither could random chance produce sophisticated language. If you try this illustration with your kids, I’d love to hear from you!